It’s for this reason that Johns, Jonathans, and Johnnys are often uninspiring Name of the Year candidates. The Johnny Dickshot Doctrine in Name of the Year lore clearly allows nicknames for consideration by the high committee, but that’s of little consequence in most cases. Commonality is simply too much of a hurdle to for most Johns to overcome, even when taken in the diminutive. So it requires a special Johnny to make the Name of the Year ranks. A Johnny to remember. Not a Johnny for the average John. A fun last name alone isn’t enough. If NOTY High Committee champion Kobe Buffalomeat had a brother Johnny—Johnny Buffalomeat—he might make the cut. If fictional Johnnys Johnny Karate or Johnny Tsunami were not, um, fictional, then they might make it too thanks to the sing-songy nature of their names. But it’s hard to say. These aren’t real people and Name of the Year treads in cold, hard facts. What precedent there for a Johnny making a run isn’t particularly inspiring: In 1996, Johnny Economy ranked among the finalists, but the high committee voted him to an 11th-place finish. This is the long way of introducing to the world to Jonathan Anomaly. Jonathan Anomaly is an academic, working, according to his personal website, “at the intersection of ethics, economics, and biology.” Mr. Anomaly co-edited an aptly titled book about philosophy, politics, and economics and has written numerous academic articles within his areas of expertise. He’s credited by his full name, Jonathan, in these documents, but shortly after publishing the 2019 Name of the Year bracket, the high committee learned exciting new news: Mr. Anomaly also goes by Jonny. Jonathan Anomaly just barely made this year’s bracket as a 16-seed, but perhaps the Jonny moniker gives him that extra push. Is Jonathan “Jonny” Anomaly is now underseeded? Does he stand a chance in a crowded bracket, facing juggernaut one-seed Surender Nada in his first matchup? What happens next is in your hands, dear voters. Only you can decide if Jonny Anomaly will be the Jonathan anomaly that makes Nada surrender. And there’s elsewhere to look for upsets. Can Voltaire Casino play a winning hand and force Dr. Trent Artichoker to dip? Can Sureal Sparx take a bite out of Sharky Laguna? Is there life in Breadoflife Faiupu’s fight against the passion of Precious Orji? We have questions, and you’ll provide the answers. 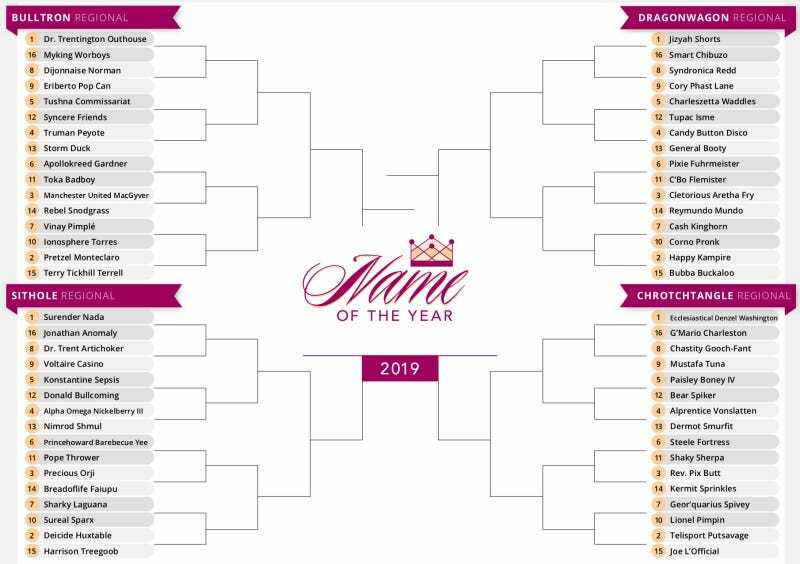 Share your opinion below, follow us on Twitter, and if you have a name worth of NOTY consideration, send it to us at nameoftheyear@gmail.com.